Did you know a trillion plastic bags are used worldwide every year? That there over 850 million toothbrushes end up in the landfills every year? That nearly a million plastic beverage bottles are sold every minute and that Americans toss millions of plastic straws every day? Our office alone gave out over 1500 toothbrushes last year. There is nine million tons of plastic waste that ends up in the ocean every year! That is a LOT!!!! These are just a few of the reasons why we want to become a more eco friendly office. Along with trying out different types of floss, we decided to go and try different kinds of toothbrushes that are better for the environment. We discovered that there are toothbrushes that are made out of bamboo and that they are biodegradable! We have tried several different kinds of bamboo toothbrushes and these are our thoughts about each one. The first one we tried is made by Wowe,it has a thick and wide handle and is white in color and has 12 columns and 4 rows of bristles. The texture of the bristles are soft and contoured and they come in a cardboard package. These brushes come in a pack of 4 for $10.97 which makes them $2.74 per brush. The next brush is made by Bamboo Roots. This brush is very similar to the Wowe one as far as the handle size and bristle size, but it does have a longer stretch of bristles and is more of a medium- soft brush. The downside to this brush was that although it came in cardboard packaging, the toothbrush itself comes in a plastic bag. These brushes came in a pack of 4 for $8.21, which makes them $2.05 per brush. Another brand we tried is Electric Avenue. Their brush has a cylindrical shape with different color ends so family members can tell their brushes apart. All the bristles are the same length and there are 9 columns with 4 rows of bristles. This brush also comes in a natural color. Although it's labeled as a soft brush, it a more comparable to a medium brush in our opinion. These brushes come in a pack of 4 for $10.97, which makes them $2.74 per brush. Babbo LLC makes a brush that is very similar to the Electric Avenue brush but these brushes come in a natural color and black. In addition, they also have different colors on the end of the handle so it is easy to tell them apart. These brushes are a bit more expensive at $10.97 for 2 brushes, which makes them about $5.48 per brush. The last toothbrush we tried is made by Dr. Perfect. The handle is thin, flat, and contoured. There are 10 columns and 4 rows of bristles, with varying lengths of bristles. The bristles on this brush were soft and came in a natural color. These brushes also come in an individually wrapped paper bag. The brushes come in a pack of 12 for $13.00 making them $1.08 per brush! After trying all these different bamboo brushes, we decided on a favorite. And the winner is… the Dr. Perfect brush. This brush not only is the most economical brush, but also has the softest bristles and is the most eco-friendly. We hope this review helped! Happy brushing! Dental Questions: Why do I need a root canal if my tooth doesn't hurt? Has a dentist ever looked at an x-ray of your teeth and recommended a root canal? You probably know that root canals are performed to remove aggravated (and painful) tooth nerves. Why would a dentist want to do this procedure on a tooth that has never bothered you? The truth is that root canals are often used to protect teeth with "dead" nerves from future pain and infection. Take a look! A root canal is a dental procedure where the nerve of the tooth is removed and the resulting empty nerve canal is filled with a sealing material. They are performed on teeth with some type of irreversible nerve damage. This typically stems from bacteria, trauma or deep/extensive dental work. Patients may complain of a painful tooth that throbs or has an exaggerated reaction to cold foods/drinks. These can be clues that the nerve has become so severely agitated that it will eventually wither out and die. Conversely, a patient can indicate that the gums around the tooth are swollen, the tooth is sensitive to biting or that there is a bump or pimple on the gums above a tooth. These types of findings suggest the nerve in the tooth has already died, and is now fueling a localized bacterial infection called an abscess. Either way, these types of teeth will eventually need root canals to solve their issues. Why might you need a root canal on a tooth that has never bothered you? A certain portion of the population will have the nerve in a tooth die in response to bacteria or trauma without pain or swelling. These teeth are usually discovered incidentally at a dental exam by visualizing an abscess on an x-ray. In most instances, this does not pose an emergency or cause for immediate concern. However, leaving the problem long term can lead to swelling, pain or the spread of infection. Dental treatment recommendations can be difficult to understand, particularly when they involve root canals, crowns, implants or other complex procedures. At Thousand Oaks Family Dentistry, we are here to walk you through any difficult or confusing dental situations. If you would like to know more about root canals, crowns or types of dental plain, please give our office a call! Dental Questions: Is Nitrous Oxide Safe? Nitrous oxide, also known as "laughing gas," is the most common form of sedation used at dental offices nation wide. It can calm anxious patients and turn a stress filled dental visit into a relaxed experience. With its strong effects, you may be concerned that nitrous oxide has the potential to be harmful when used at dental visits. On the contrary, it is one of the safest relaxation drugs at a dentist's disposal. Take a look! When administered at a dental office, pure nitrous oxide is mixed with pure oxygen in a mixture not exceeding one-to-one. In this setup, there is actually more oxygen in the nitrous mask than in ambient air, making it safe for those with breathing problems such as asthma. The nitrous system delivers the gas via a nose hood that both provides medicine to the patient and removes it as they exhale. This prevents other occupants in the room from receiving secondary doses of nitrous. It typically takes about five to ten minutes for a patient to feel the effects, and about the same amount of time for the gas to wear off when stopped. Most patients are fine to drive themselves home or return to work after receiving nitrous oxide sedation. Nitrous oxide works by stimulating receptors in the brain stem to create a calm, sedated and relaxed sensation in the recipient. Contrary to the name "laughing gas," it should make you feel sleepy or compliant during treatment. When used properly (in a healthcare setting with proper equipment) it is virtually impossible to overdose on nitrous. The gas is eliminated from your body by breathing, where you gradually exhale it from your blood supply and back into the nitrous mask. Naturally, nitrous oxide isn't for everyone and should only be used for patients that truly need sedation. Needlessly adding nitrous to a dental procedure adds unnecessary risks and difficulties to the treatment. If you would like to know more about dental sedation options, nitrous oxide therapy or other ways of coping with dental phobia, please give our office a call! Dental Questions: How can I clean around braces? Braces can make cleaning any mouth very difficult. The wires, bulky brackets and food trapping ledges all contribute to problems with home care. Fortunately, there are many great products and techniques for keeping your orthodontic appliances clean. Take a look! A typical example of floss threaders. One of the most obvious difficulties in cleaning around braces is the inability to floss between teeth. The orthodontic wire prevents regular dental floss from reaching the critical areas at/beneath the gum line. A typical solution to this problem is using a floss threader or dental floss with a built in threader tip. 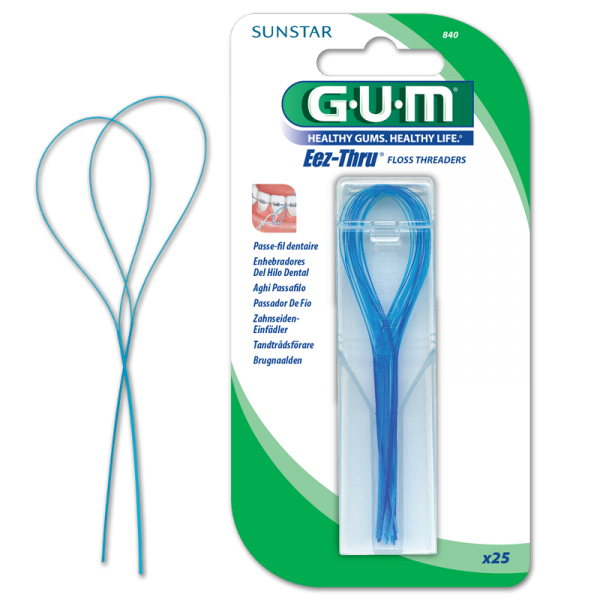 These products allow you to push the floss underneath the wire and reach all areas of the teeth. Newer devices like GumChucks ORTHOgami achieve the same outcome, but with a different form factor. For younger patients, dental picks and floss brushes should be used carefully, as they have the potential to damage the gum tissue and cause bleeding. They are, however, useful for cleaning sticky food out from between the wire and tooth. Brushing around the wires and brackets relies more on careful technique than a special product. You will probably need to make a conscious effort to get the toothbrush positioned underneath the wire and into the various angels of the brackets. Some companies sell special orthodontic brushes with smaller heads for manuvering around the appliances. Still, a standard toothbrush and good technique should be sufficient for most patients. Keeping the gums and tooth surfaces around the brackets healthy is a priority for any patient in braces. You don't want to finish your orthodontic treatment only to have cavities in your beautiful smile! At Thousand Oaks Family Dentistry, we know that braces can turn dental hygiene into even more of a chore. We are here to make the process as easy as possible. If you would like to know more about braces, orthodontics, toothbrushes or dental cleanings, please give our office a call! Dental Questions: Is coffee bad for your teeth? Coffee: possibly the most widely consumed non-alcoholic beverage other than water. With about 400 million cups drank EACH DAY, it is difficult to deny it's importance in our daily routines. As you probably know (or experienced), the dark pigments in this drink can cause discoloration or yellowing of the dental enamel. Beyond the cosmetic concerns, can coffee consumption harm your teeth? While it is difficult to give a definitive yes or no, there are some considerations you should take when going back for your next cup of joe. As a reminder, anything you eat or drink other than water has the potential to demineralize enamel and start the tooth decay process. Black coffee has a pH of about 5, meaning it is acidic enough to weaken enamel and cause initial decalcification. However, coffee has no carbs or sugars and thus cannot fuel the cavity-causing bacteria. The problem arises when sugar, cream, milk or other products are added to your beverage. Even something non-sweet like skim milk has the carbs necessary to feed bacterial growth and cause new decay. Are we suggesting you quit drinking coffee cold turkey? Of course not! Still, there are ways you can adjust your consumption to better protect your teeth. Keep in mind that its not the amount, but the duration of carbohydrate consumption that determines tooth decay. Try to limit your coffee drinking sessions to set time frames, rather than sipping on one or two cups all morning. Swishing with water after drinking can help too, and protects against further staining! At Thousand Oaks Family Dentistry, we know that creating good dietary habits is a moving target. We are always here to help you make great choices in protecting and improving the health of your teeth. If you would like to know more about tooth decay, how to protect your teeth or any other dental topics, please give our office a call! Dental Questions: Does every tooth extraction require stitches? Wether you've had a tooth extracted before or not, chances are that you have some idea of what is involved in this procedure. You would probably expect that every patient gets stitches (professionally called sutures) before they are allowed to leave. A dentist wouldn't let you go with a giant hole in your jaw, right? On the contrary, there are many times that sutures aren't a necessary step after extracting a tooth and do not improve the healing process. Take a look! In the mouth, sutures can assist in the healing of gums and other soft tissues by holding them in a desired place. In complex dental extractions, such as removing wisdom teeth or impacted teeth, the bone and gums around the tooth may need to be moved or partially removed. To ensure that the gums heal cleanly around the jaws and do not create a food trap, sutures are used to approximate natural soft tissue contours. Additionally, stitches are used to help in the formation of healthy blood clots and to help keep grafts and membranes in place during critical healing periods. For "simple" dental extractions, sutures are not always required. When there is minimal manipulation of the gums and bones AND the patient has a healthy immune system, it is reasonable to expect that the tooth site will heal with no sutures. For most patients, a "scab" will begin to form in the mouth before they leave the dental office, and nearly all bleeding will cease within 2 hours. Research shows that sutures will not help the gums or bones heal faster or assist in preventing post extraction infection. On the contrary, the most important determining factor in extraction outcomes is following the post operative instructions given to you by your dentist! It is often hard to tell if a patient will need sutures until after the extraction procedure is finished. Sometimes, even the most simple-seeming teeth require more manipulation and work than they initially let on. As with every procedure, we do our best to inform you of changes to your treatment plan as they arise. If you would like to know more about tooth extractions, oral surgery or other dental procedures, please give our office a call! Dental Questions: Why would a dentist place a temporary filling? A filling is a filling, right? Then why would a dentist send you home with a "temporary" filling? What makes it any different from the permanent fillings you have on your other teeth? Do you need to worry about it falling out? Read on to see how and why dentists use temporary fillings to save and protect teeth! A temporary or sedative filling is a type of dental procedure performed on a tooth with an uncertain prognosis or as an intermediate measure before further treatment. Imagine a patient who comes in for an emergency appointment with a large, painful cavity. While definitively saving the tooth may require a few different lengthy treatments, a dentist can remove decay and provide a temporary filling that same visit. This allows a tooth to be stabilized and desensitized so the patient can continue to function until a more definitive plan can be made. Many times, it is simply too early to determine the status of the tooth's nerves or gums and thus a temporary filling acts as a good interim measure. The most common material used in temporary fillings is a tooth colored compound called glass ionomer. This product bonds to tooth enamel, reacts well with moisture and has a natural calming effect on aggravated tooth nerves. Additionally, it enhances the effects of fluoride to provide extra defense against decay. The trade off is that glass ionomer is much weaker than permanent filling materials and does not stand up against tooth brushing, eating or chewing over time. Still, it's properties make it an ideal material to be used in temporary situations. How long will your temporary filling last? That question is impossible to answer without knowing the condition of the remaining tooth. In general, you should always end your temporary filling appointment with a plan for a permanent solution in the future. If you would like to know more about fillings, crowns, root canals or other dental procedures, please give our office a call! Dental Questions: Why do my teeth shred floss? Shredding or tearing floss is a common (and annoying) obstacle to keeping your teeth clean. Having to constantly switch to a new piece or use a frayed length of floss gets old fast. What could be causing your flossing woes? Take a look! Between every two adjacent teeth exists a contact where they touch each other at their widest points. This space should be smooth and flowing, without any ridges or sharp corners. If you are shredding floss, there must be some sort of edge in this area that is disrupting the floss fibers. Many times, this is the result of a filling placed between two teeth that needs to be smoothed out. Small pieces of excess filling material, called flash can become dislodged and create an edge that tears at the floss fibers. The solution to this problem is to have a dentist smooth out or (in more drastic situations) replace the filling, creating a more anatomically correct shape. Floss can also shred due to food, tartar, or other debris lodged in between teeth. Tartar, in particular, is rough and irregular, creating a surface that easily tears at floss fibers. The solution to this problem is to have a dentist clean the affected teeth, and return for normal dental hygiene appointments. When combined with regular cleanings, good flossing technique will remove stuck food and prevent the formation of harmful tartar in the future. Flossing every day is one of the easiest and most beneficial additions to your home hygiene routine. Even if your teeth shred floss, we urge you to continue to use it daily to help maintain the health of your gums and bones. If you would like to know more about flossing, brushing, oral health or any other dental topics, please give our office a call!